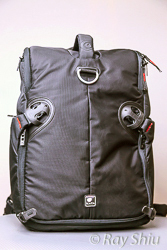 The Kata 3N1 33 Camera Backpack was the largest in the 3N1 line (not including the PL series). The 3N1 refers the the 3 different ways you can carry this bag. Either as a sling bag, (right or left shoulder), a backpack or the 'X' position. This is accomplished via a clip buckle system that the shoulder strap uses to attach to the waist belt portion of the bag. For stowing or placing on conveyor belts (security screenings) you can unclip the shoulder straps and stow them in its designated spot "inside" the bag and use the large handle on the top of the bag to carry like a suitcase. The 2 digits after the 3N1 indicate if it has a laptop compartment or not. The 22, 33, 25, 35 all have a laptop compartment. The 20, 30 do not. Also the PL designation stands for Professional, Light and it costs more. I'll leave that up to you to decide if the minor changes are worth the extra $$$. 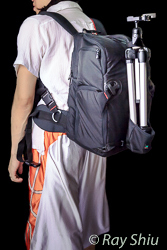 For photographers needing a large bag to carry a lot of gear, a tripod/monopod AND still be able to access their gear quickly. Off the top of my head, nature/wildlife shooters who hike a lot, urban/street shooters who don't want to walk around with a dangling camera. 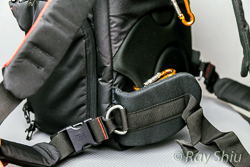 If you're looking for a bag for just carrying a load of gear, then there are bags that are configured to hold more, the trade off is the accessibility of your gear. I also have a Lowepro Computrekker AW which I used to use for carrying a large load but it was too tedious and annoying to get my gear out and shoot.I also have a Crumpler 7 Million Dollar Home (sling bag) and after a few hours, both shoulders were sore. The Kata 3N1 33 bag, fit my needs perfectly for those occasions when a lot of gear was necessary and time/distance in the field was of significant duration. I won't bore you with the usual dimensions of the bag as I'm sure you'd see them later if/when you decide to buy the bag. I will show you lots of pictures and stuff to show you how big it relates to an average sized person. Check out the photo set on my flickr slideshow below. I'll even put up a video of what I can stuff and subsequently carry in it. So, I bought this bag out of desperation right before a 2 week trip to Europe (London, Paris, Rome). Yeah, it was way too short, looking at the itineraries and reading up on the cities there were so many "be careful" warnings that I felt/knew the Lowepro Computrekker would be a no go (have to set the bag down and get your gear). These warnings aren't just of crime and stuff, but of security checks at museums and having to take out/ put in gear and size restrictions. To read about some of the issues I had, check out my blog post. NOTE: I couldn't get into the Louvre with the Kata but I could with the Crumpler 7 MDH. Basically, the 7MDH could get into all the museums that allowed bags that I visited and I suspect the Kata could get into many but not all. What was I carrying? Well, to keep this short, I had 2 camera's with battery grips, a medium zoom on one and an ultra wide zoom on the other. I also had a telezoom, a super zoom, a fish-eye, a teleconverter, 2 flashes, and a few pouches carrying filters, triggers, cleaning kit, batteries and memory cards. Sometimes I had my tripod too. I kind of cheated as well. I used a a belt and had empty modular pouches (made by Think Tank Photo) to carry stuff once I arrived at the destination and took out some gear. I later found a dual shoulder harness (made by Optech) during a sightseeing tour so I carried my cameras under my jacket and changed lenses out of the Kata in sling mode. I'll put some links to the other stuff I use further down. The only time I had to set the bag down was when we stopped to eat or stopped for group photos. Since the bottom of the tripod holder is flush with the bottom of the Kata, the whole bag is self standing and pretty sturdy too. Perfect for me! I didn't even need to take off the bag to unload the tripod, set it up and take a landscape shot. Run and Gun style! Aside from the tripod being flush with the bottom of the bag, I really love this one handed open option that Kata uses. 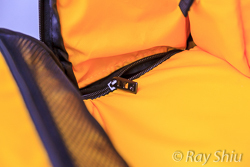 Basically, there is a little tab that sticks out and prevents the 2 zippers from coming together. When the buckle is closed, it covers the tab and zippers so it's fairly secure. So when you you swing the bag to the front you grab the buckle, pinch to undo and pull. This unzips the side panel and you use your free hand to pull out camera. It's swift, it's fast. 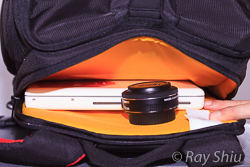 I leave my lens cap off, camera on, and I can almost start shooting as soon as I get the camera clear of the bag. The tab can be pushed back into the bag and when you close the side panel and the zippers touch, it's pretty difficult to pull it back open. The zippers also have holes in the "handle" so you can use a small padlock to lock them together. This whole compartment can be unzipped (have a look at the photo in the slideshow) if you unclasp the stopper/tripod holder clips. The other cool feature is that only the top of the shoulder strap is permanently secured to the bag. the bottom is secured to the bag via a buckle. It all looks and feels secure enough and after my Europe trip, I'm confident that it's strong enough to last. This allows the different carrying configuration. The coolest bit is, the way the straps can be tucked back into the bag, straps and all. Even the waist belt can be tucked in, making a tall rectangular suitcase bag. There's a slightly recessed strap across the back of the bag (where your back touches) which allows this Kata to be slipped through a trolly's handle. Oh, the shoulder strap and it's corresponding buckle are color coordinated so even guys like me won't get it wrong. Never thought I'd get "hurt" using a backpack but I did. Here's why: I don't like using the waist belt and I don't like things dangling so I stuffed the waist belt into its' compartment leaving only the metal D ring and shoulder strap attachment buckle exposed. 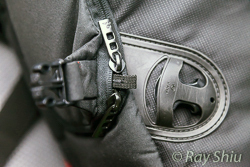 As you can see in the photo, the attachment buckle can move around on the D ring. I'm not exactly sure what happened but I think my shirt creeped up or was too thin but my skin got clipped I'm guessing between the buckle and the metal D ring. It hurt ! This happened a few times and it got so sore I had to pull out the waist belt. It's never happened when my clothing was thicker (than a t-shirt). The other thing that I really don't like is the "pocket" for the rain cover. I'm not even sure it is the pocket for the rain cover, but that's where I originally found it. I'm talking about the area in the inner back panel of the back pack. The inside (yellow) panel of the side that goes against your back. If you look at the very bottom of the bag, you'll notice it's velcro'd. If you undo the velcro, the rain cover was in there as well as the plastic foam padding. You can pull the whole piece (foam) out of the bag if you wanted to. I find that kinda cheap. Check out the photos in the flickr slideshow below to see what I'm referring to. I really like this bag, even though I get pinched by it every now and then. It's a small sacrifice to pay in contrast to its sheer versatility. I'm pretty sure I wouldn't have had as much "fun" or as safe a time in Europe if I wasn't able to shoot and stow my gear so quickly and efficiently. If you're still undecided, I would recommend you take a closer look at this style bag (larger or smaller) depending on your gear and shooting style. I have an un-stuffing video that hope helps to illustrate what I can fit in there comfortable depending on what gear I bring. Also, some of the photos in this flickr set have notes on them. Feel free to check 'em out if my description isn't clear. If you want to watch a "what fits inside" video, HERE'S ONE.